The 2019 Honda Civic Sedan and Coupe receive a number of upgrades aimed at further solidifying Civic's status as America's retail best-selling passenger car. Launching at Honda dealerships beginning October 10, the refreshed Civic Sedan and Civic Coupe will feature new design cues inside and out, standard Honda Sensing® technology for all trims, and a new Display Audio system with physical buttons and a volume knob. Civic Sedan and Coupe buyers will also have a new Sport trim to consider, featuring unique styling, upsized 18-inch wheels and tires, enhanced handling and value-added feature content. The 2019 Civic Sedan is available in five generously-equipped trims: LX, Sport, EX, EX-L and Touring. Civic Coupe is available in LX, Sport, EX and Touring trims. The 2019 Civic launch will continue later this year with the Civic Si Coupe and Sedan, Civic Hatchback and Civic Type R. Details concerning the rest of the 2019 Civic lineup will be announced at a later date. 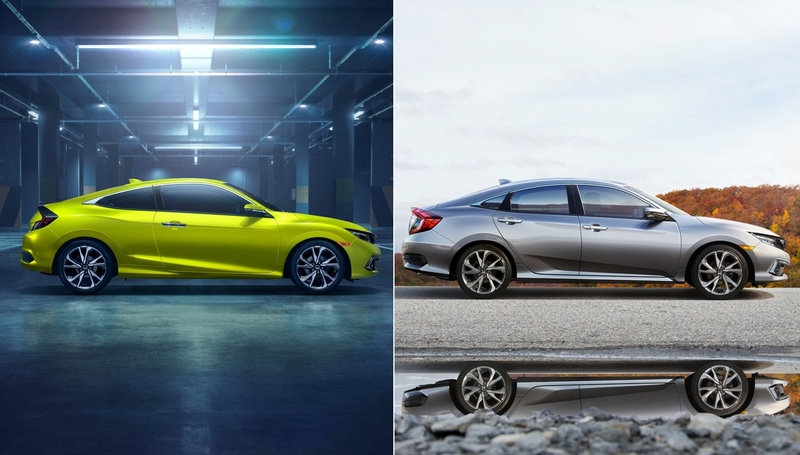 The 2019 Civic Sedan and Coupe both feature refreshed styling that subtly updates the highly popular 10th-generation Civic design to give America’s favorite car an even more aggressive impact while simultaneously imparting a more premium feel. The restyled lower bumper gives Civic a wider look and is complemented by a new blacked-out headlight treatment. The Honda-signature “wing” design on the grille also gets a new gloss black treatment on Sedan and Coupe. On Touring trims, the LED headlights have been upgraded with a new design to give the lights a wider and longer beam. The new, more aggressive tone is given an air of sophistication by the subtle use of chrome accents on the front bumper. At the rear, Civic Sedan’s lower bumper receives a chrome strip to emphasize Civic’s premium feel. Civic also receives three new colors: Platinum White Pearl, Molten Lava Pearl (Sedan only), and Tonic Yellow Pearl (Coupe only). Inside, Civic Sedan and Coupe models benefit from a number of subtle improvements centered on providing a more refined driving and ownership experience. The Display Audio system, standard on Sport trims and above, has been updated with a new interface that includes a volume knob and physical buttons for key functions, in addition to improved Bluetooth® integration with easier device pairing. Additional improvements on all trims include redesigned steering wheel controls for more intuitive operation, a new center console cupholder that better holds larger beverages, and updated dash trim with gunmetal gray on LX trims (LX and EX for Coupe), metallic finish on EX, EX-L and Touring sedans (Touring only for Coupe), and with an embossed finish on Sport trims. All Civic Sedans and Coupes also benefit from additional sound insulation in the floor, trunk, and front fenders, with new sound insulation in the rear fenders. Slotted between the LX and EX trims, the 2019 Civic Sedan and Coupe Sport trims utilize a responsive 2.0-liter engine paired with either a 6-speed manual transmission or optional Continuously Variable automatic Transmission (CVT). Visual enhancements consist of unique exterior styling cues such as fog lights with gloss black trim and upsized 18-inch wheels (+1 inch) wrapped in the same all-season tires as the Civic Si. Out back, a black-painted decklid spoiler, Sport badging and a sport muffler capped by a wide, center-mounted chrome exhaust finisher styled after Civic Si complete the package. Inside, Coupe and Sedan sport trims get red gauges, a leather-wrapped steering wheel and shifter, paddle shifters (CVT-equipped models), textured aluminum sport pedals, and unique seat materials with a combination of synthetic leather and cloth. The sport trim also gets upgraded tech over the LX model along with an 8-speaker audio system as described below. Standard equipment on Civic Sedan and Coupe models includes the Honda Sensing® suite of safety and driver-assistive systems, including new automatic high beams. Additional standard features on all trims include upscale items such as an electronic parking brake with an automatic Brake Hold feature and a 7-inch digital TFT instrument cluster. Civic Sport models build off the LX trim with the aforementioned exterior and interior design upgrades, and a redesigned 7-inch Display Audio system that includes Apple CarPlay™ and Android Auto™ integration. Civic EX models receive the new Display Audio system as well, in addition to newly standard dual zone automatic climate control with new fan speed buttons. New for 2019, Civic EX Sedan also receives an 8-way power adjustable driver’s seat, along with a leather-wrapped steering wheel and shift knob. Additional Civic EX features include 17-inch alloy wheels, a power moonroof, Honda’s exclusive LaneWatch™ side-view camera, hands-free entry with push button start, an updated audio system with 8 speakers (10 speakers in Civic Coupe), heated front seats and exterior mirrors and remote start. The EX-L trim, exclusive to Civic Sedan, adds leather-trimmed seats, an auto-dimming rear view mirror and Homelink®. At the top of the Civic Sedan and Coupe lineup, the Touring trim adds newly designed 18-inch wheels, paddle shifters (with CVT) and sport pedals. Also included on Civic Touring are LED headlights that have been redesigned for a longer and wider beam. Rain-sensing wipers, side-mirror turn signals, heated rear seats (sedan only), embedded navigation and an updated audio system are also feature upgrades for all Civic Touring trims, while Civic Touring Sedans also get a 4-way power passenger seat. The 2019 Honda Civic Sedan and Coupe LX and Sport trims are powered by a 2.0-liter 4-cylinder engine producing 158 horsepower and 138 lb.-ft. of torque. Connected to either a 6-speed manual transmission or CVT, the 2.0-liter provides lively performance and laudable EPA fuel economy ratings. CVT-equipped Civic EX, EX-L and Touring trims are powered by a 1.5-liter turbocharged 4-cylinder with peak output of 174 horsepower (SAE net) 162 lb.-ft. of torque (SAE net). EPA fuel economy ratings with the 1.5-liter engine remain among the best in class, with top ratings of 32/42 city/highway mpg2 for EX and EX-L trims.